This exciting project was inspired by Project Runway. I have fill three suitcases with consignment items and put students in project groups. Groups choose a suitcase and refashion a garment out of the items in the suitcase. They take before and after pictures and learn a variety of construction techniques along the way. 16.3 Demonstrate fashion, apparel, and textile design skills. I have some various suitcases filled with three or four consignment items that sort of coordinate color wise. Students are put in groups of three or four. 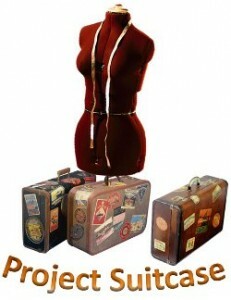 Each group chooses a suitcase without seeing its contents and they each have a dress form to use. The group opens the suitcase and then thy start sketching ideas to incorporate each piece into one garment. Students are not allowed to cut anything until the design idea is shared with the teacher. Sometimes I have each member of the group come up with a design. Then the group decides the best plan. Students may not know the correct construction technique, but that is where the teacher steps in to teach them how to successfully construct the garment. I use a rubric for the project which includes design and execution of design ideas as well as group or team work throughout the process. Students also photograph the separates before construction begins and more pictures are taken at completion of the assignment. The dressed dress forms are displayed at our art show with the photos and design sketches. Many students like to watch Project Runway on the Lifetime network. I use the “project progress” rubric below for extra credit. This gives them a chance to follow the victory, or defeat of one of the contestants week after week. What a great project. Do you have a copy of your "orange" folder information? What are did you use for the style references for the "orange folder"?